ZJTEX solar air conditioning system use solar collectors to gather the sun power and put the heat as part of heat that compressor needed, save the part of electricity of compressors need. It is named solar-assistant air conditioners, its compressor and refrigerant same as normal ones just save cost for electricity. It could save 60% cost in the day with sunshine and 30% in the night. * Current available technologies are neither practical nor cost-effective. * Photovoltaic (PV) systems cost is many times more than a conventional air conditioner. * Thermally driven absorption cooling requires costly, high-temperature collectors and undesirable cooling towers. * ZJTEX solar air conditioning system quite fit the seasonal demand, which means, the COP is increased as the solar energy is most plentiful in the summer. * Freon, widely used by conventional air-conditioners, is damaging our atmosphere. Our ZJTEX solar air conditioning system works with our special medium and newest refrigerant which is completely environment friendly. * Vacuum tube solar collectors were invented in the USA and China decades ago, mature technology and high quality will guarantee the performance of our solar air conditioning system. 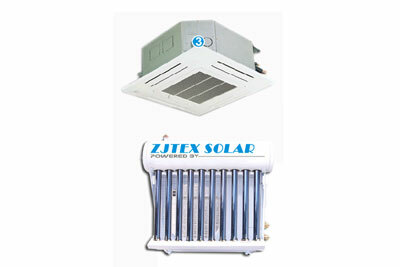 * ZJTEX solar air conditioning system are cost-effective. Our solar air conditioning system is produced in the USA and China, due to the low cost of the labor, land and R&D. The price of our solar air conditioning system is very competitive and affordable for our clients worldwide. * ZJTEX solar air conditioning system can combine air-conditioning and solar hot water systems together, therefore enhance market attractiveness. * Our products solar air conditioning system has all the functions as conventional Air-Conditioners do. Such as dehumidification and bacteria free ventilation to help refresh the air inside your home or business. * Our standard products have different capacities which is easier to design larger systems, which help fit the needs of any commercial project and make our system more customized. * Easy installation, making operation time less consuming. Our system is compatible with conventional shafts, local conventional certified A/C installers can get installations done perfectly with 3 days training. * Our products use high quality components, like HITACHI compressor, all copper tubing and treated stainless steel metal, providing top of the line quality. Domestic use of solar air conditioning effect what? Solar air conditioning is a dual-fuel air-conditioning, as with free solar energy absorption chiller sunny day, rainy days and at night, use natural gas afterburning. It's a very important feature is more intense solar radiation, the stronger the ability of air conditioning and refrigeration. Tianjin one million kilowatts this year's power shortage, if the use of solar air conditioning can make up for the power shortage, power supply "peak" pressure bleeder. The use of solar air conditioning very economical, because free sunshine, low running costs, users can enjoy near-luxury air-conditioned. Both summer and winter, solar air conditioning can not only provide users with free cold can also provide hot air and hot water. The lack of sunlight or storage of energy is exhausted, the machine will automatically switch to the use of natural gas to be sunny, then switched to sunlight as the energy, the work is done by software control of all switching done automatically, the user does not need hands. Gas air conditioning has been installed the user can also easily add solar air conditioning function in. According to experts, the data show that an area of ​​100 square meters of solar collector systems for building cooling throughout the year saving 20,000 degrees. Solar air conditioning nowadays mainly applies to large buildings and plant or into pieces and entire residential buildings, while residents of a one used alone (outside the villa) seem inconvenient, not economic. Copyright © 2010 ZJTEX ELECTRIC GROUP COMPANY LIMITED All rights reserved.